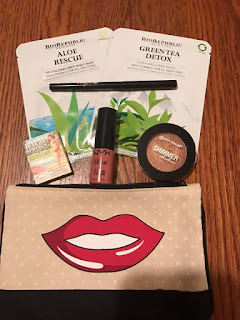 If your not familiar with Ipsy it is a monthly beauty subscription box. You get a small makeup bag plus 4-6 deluxe and full sized products. The total cost is $10 a month. I'm always happy to receive sheet masks as they are part of my weekly routine. This is a trendy product, too, so I'm happy to see them featured in an Ipsy bag. I haven't used this brand so it is new to me. This product has the strangest wand applicator because it is almost a diamond shape with a whole in the middle. It effectively picks up product and is fairly easy to apply. This formula is whipped in texture and has a cherry vanilla fragrance. The NYX website says this is for the lips and cheeks. I'm not so sure. It is fairly hydrating and doesn't really dry down. It sort of evaporated quickly on my lips. I won't be trying it on my cheeks as I'm afraid of break outs. This is a sample size which means it can be a tad tricky to get your brush in the pan but overall I'm pleased with this product. It is a pinky peach shade. The Balm blushes are some of my favorites and I did not have this color in my collection. I needed a new eyeliner in brown so this made me very happy. I'm hoping it is long wearing because it says 24/7. This is the most unusual formula. It has fall out but it feels like spongy or gel like. The color is a beautiful coppery color. I think it will be great for one shadow looks. I'm pretty happy with this months bag. The only thing that is a miss for me is the NYX lipgloss/cheek color. I just don't feel like it is anything special. 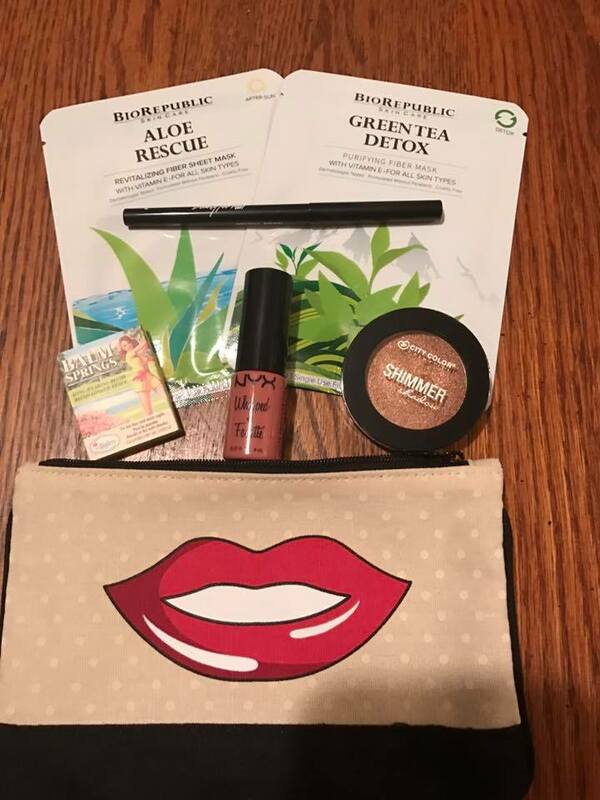 If your interested in trying Ipsy you can sign up here.